This cookie recipe showed up in my life and I had a sudden realization that all this time (we’re talking 35 years here, people), I thought my life my life was fulfilled and complete and happy but really, without even knowing it, I was missing something essential. There was a hole in my soul, if you will. And it could only be filled by Chocolate Sugar Cookies. I have a deep and abiding love for sugar cookies. They are my favorite cookie of all-time. But when you adapt the beloved sugar cookie to be 100% full of chocolate splendor and eliminate the need to refrigerate, roll and cut; well, I’m undone. I had to give these away approximately 3 seconds after baking them. Don’t worry, I ate more than would be deemed appropriate before unloading them on friends but keeping the other half of the cookies within the four walls of my small home would not be a healthy choice at this point in my life. However, even after pawning them off on unsuspecting friends, I can truly say that now more than ever, my life really is complete. Thank goodness it only took something as simple as cookies (and not, say, a new Ferrari or set of All-Clad pots and pans). These cookies are rich and really unbelievable. Pour the granulated sugar on a plate or shallow dish like a pie plate and set aside. In a medium bowl, stir together the flour, cocoa, baking soda and baking powder. In a large bowl, melt 10 tablespoons of the butter in the microwave. Take care not to overheat; microwave the butter until just melted. Stir in the remaining 4 tablespoons butter until melted. Allow the butter to cool for 5-10 minutes (it should be about 90-95 degrees on an instant read thermometer). Whisk the brown sugar, vanilla and salt into the melted butter until the mixture is completely smooth. Whisk in the egg and egg yolk until smooth. Stir in the flour mixture until just combined. Roll the dough into balls, about 2 tablespoons for each cookie. Roll the balls in the granulated sugar and place on lightly greased or lined (with parchment or silpat liners) baking sheets. Using the bottom of a glass, flatten the cookies to about 1/4-inch thick, more or less. Sprinkle the cookies with a bit more granulated sugar (just a pinch per cookie). Bake the cookies, one sheet at a time, until they have puffed and have cracks running through the top, about 12-14 minutes. Don't overbake or the cookies will be dry. Transfer the cookies to a baking rack to cool completely. Note: It is really important that the butter isn't too hot when you start adding other ingredients to it. If you don't have a thermometer to test temperature, let the butter sit for the full 10 minutes. It should be at warm room temperature but not hot at all. Also, if you are curious about subbing light brown sugar, do so at your own risk. I have only ever used dark brown sugar - it helps the chewy factor be even more, well, chewy. I made these on a whim the other day and I’m so glad I did! They turned out absolutely perfect. My husband had more than one… which is saying something because he’s not a huge fan of sweets. I will definitely be saving this recipe to use again! Just made these cookies. They came out great. Had to add a little more flour to stiffen up dough. Other then that they look just like the pictures. Definitely a keeper. My family and I have a new favorite sugar cookie.! I made them with the Hersey’s Special Dark Cocoa awesome. They are absolutely perfectly delicious!! They look black like an Oreo since I used the Special Dark Cocoa. Followed recipe to the “T”…not possible to roll.but used as a drop cookie and WOW!!!!! SO DARNED GOOD! I’ve just started weight watchers so I tried substituting some mashed banana for part of the butter (used one small banana, 1/4 c margarine and about 2 tbsp I can’t believe isn’t not butter light). I don’t mind a little banana flavor if it’s going to cut fat calories. I did have to add more flour, it was still soft so I just just small cookie scoop. Very good cookie. I made these yesterday, and they taste delicious. I don’t know what I did wrong, but they are as hard as a brick. Maybe I cooked them too long? Help! Hi Melanie – if they are that hard, it does seem like they might have been overcooked. How long did you bake them? I made these tonight!! I didn’t have any Brown sugar so I used white with a spoon full of molasses. They taste amazing. Huge hit! Oh my these are delicious. First time I made them I didn’t make the cookie big enough and they were a little too crispy. The second time they were big and perfect!! I used some coarse sugar mixed in with the granulated sugar when rolling the dough. 1-2 dozen depending on how big you make them. I made your Chocolate Sugar Cookies. They tasted wonderful but mine were flat as a pancake. What did I do wrong? Try adding a few tablespoons more flour or upping the baking temp by 25 degrees. Fantastic! 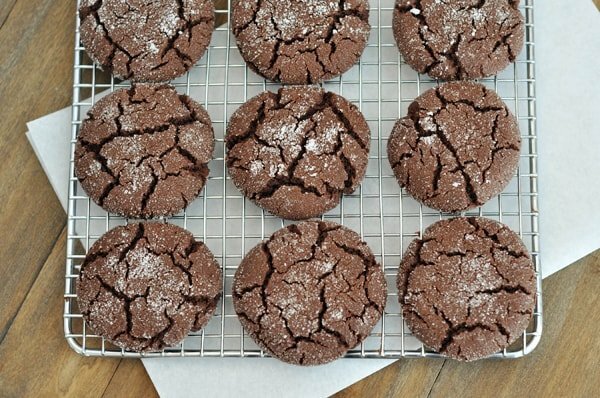 This is seriously the BEST chocolate cookie recipe I’ve ever made. Will become a regular with my baking. I used light brown sift sugar – turned out great. Really good cookie. Has a brownie taste with a cookie feel. I did however made one MAGA mom cookie(5 scoops of dough). So technically mom only had 1 cookie! Lol Thanks for the sweet recipe! Mine came out the consistency of brownie dough, not possible to roll so I just added more flour (didn’t measure) enough to make it able to roll and I cooked them 12 minutes. They came out perfect. I live in the mountains but not what is considered high elevation. It was also a rainy day. I will be making these regularly. Thanks for the recipe. Great recipe! Easy and chocolatey. Based on previous reviews I baked two test cookies. One cookie ball was flattened with a glass the other was not. The flattened cookie barely cracked and was a bit more crispy. The ball that was not flattened looked just like the picture. These are definitely a cookie i will make again. Mine did not puff up and crinkle. They flattened out completely. I followed the recipe exactly and used only fresh ingredients. What did I do wrong? Sometimes you need to add a bit more flour. Because flour absorbency varies – especially when using melted butter. Try a couple more tablespoons. I substituted pure maple syrup for the vanilla, and used light brown sugar. I cut the dough balls down to 1 Tablespoon. Then I cut the time down to 9 minutes. They turned out great! Love them! These are very good! I followed the recipe as written. The dough was soft (my butter was NOT warm) so I did refrigerate the dough. They turned out better for me using a small scoop to form the cookies (big scoop made them too big/flat). The smaller cookies puffed up a bit but didn’t really have cracks. Thanks! I will make these again!! Awesome cookies! I am allergic to eggs, so I used an egg substitute and they turned out AMAZING. I used light brown sugar too which turned out fine! How many calories in one cookie? I’m trying to determine how many I can afford to eat! They are fabulous!!! I just made these exactly by the recipe but my dough was not a,stiff consistency to make the dough balls. I had to a good bit more flour. What could I’ve done wrong? I did let my butter cool just like the recipe said. I’m not really sure, Dorothy – it could be that we just measure our flour a bit differently? Maybe buy new baking soda and powder? I had the same problem. Mush. And I weighed my ingredients. Do you live at high elevation, Kari? Making these as we wait for Hurricane Matthew. These are delicious and an addition to my tried and true recipes! Thanks! Made these today, didn’t have baking powder, but they turned out SOOO good. They were chewy, crunchy, fudgy, just awesome! Should the butter be unsalted or doesn’t it matter? Has anyone used this recipe for cut out cookies?? Oh. My. Heavens. These are INCREDIBLE. So moist and chocolately, more than just your average chocolate cookie. At first I was a little nervous to use light brown sugar, but then I went for it and the result was heavenly. Yes, about another 1/4 to 1/2 of flour was needed, but that was no problem. I can’t stop raving about these little desserts straight from heaven. Oh my goodness!!! These are absolutely the best!!! I dared to hope that they would turn out this delicious, but they did, and I can’t wait to make them again for Christmas. I did have to add about 3/4c flour to the end batter in order to handle the dough, but, it didn’t affect the flavor at all. Plus, I only baked them for ten minutes. These are definitely going in my ‘favorites’ file!! (but I think I’ll call it a secret recipe). Oh my dear gracious, these are absolutely amazing. Thank you for the pure inspiration that you put into my life! Although mine did not puff as much, they are still delicious and everyone can’t get enough of them! Thank you for the recipe! Have you tried rolling and using a cookie cutter for this dough? I need shaped cookies, but I don’t have time to frost them. Thanks! These are amazing. Thank you for a about great recipe that I will make for years to come. Decent recipe, with the exception of your instruction to smash the cookies to 1/4 inch, which is way too thin. The cookies in your picture are at least 1/2 inch thick or more. Yep, because they puff up during baking. I only had 1 1/2 cups of brown sugar, so that’s what I used. I baked them and checked at 14 minutes, and saw they hadn’t puffed up or cracked. I assumed they weren’t done, so I let them bake for another three minutes. They still hadn’t puffed or cracked, but I took them out because they were burning at the edges. I tried one and it was dry! Was is just because I didn’t have enough sugar? Or did I do something else wrong? Was it the overbaking? Hi Vega, reducing the sugar could make a difference. Also make sure you aren’t over flouring the dough. Did you use a scale? If not make sure the flour isn’t packed into the cup. Hey Mel 🙂 we are celebrating my parents 50th wedding anniversary in June, I am looking for some desserts that I can make ahead of time. We would like to do some kid friendly cookies. How are these cookies 2 days after? Have you ever frozen the dough?? If not these cookies do you have any of your other cookies that would work? I left the comment above and I believe spell check changed my email… I did not notice until I hit post comment. Love these cookies! Delicious. I made them today for my sister’s birthday on Wednesday…. thinking I may need to make another batch! Thanks for the recipe. Monica – hmmm, the lack of crackle might be due to too much flour. Try adding a couple tablespoons less next time; that may help. Good luck! My family LOVES these cookies. I never get them to crack quite like yours, but they still taste divine. Since I don’t get the “look” I tried them last week with unrefined coconut oil. Oh. my. It was divine!! You really ought to give it a try! Hi Mel, I tried this recipe last summer and they were delicious! I made them again tonight but was out of butter so I used margarine instead. When it came time to roll them out, the dough was so sticky I couldn’t touch it (I ended up dropping them by spoon and just sprinkling the sugar over the top and they were still good). Do you think the stickiness might have been because of the margarine? Thanks! Hi Marcie – yes, there is a good chance it was the margarine. I don’t use margarine so I’m not sure how it acts differently in baking but I know it definitely has different properties than butter. Interesting that it made such a difference! 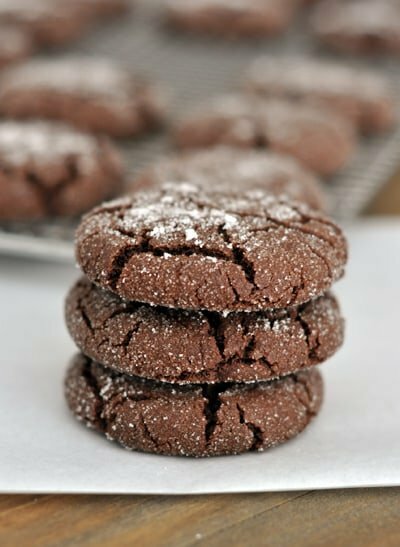 Just made these for Christmas and they were delicious — the perfect chocolate sugar cookie. Mine did not puff up and crack, and because I waited for them to do so longer than I knew I should, they were very crunchy. Everyone still loved them, though, including me! In fact, I like them better flat and crunchy (excellent for dipping in milk) and they did soften up a little in the tin. I’ll be making these again next year. Thanks, Mel! …I also used light brown sugar and had no issues. (That I know of, of course) But since I haven’t done any with the dark, I have nothing to compare them to. How many cookies can each recipe make? I need to bake 120 cookies for tomorrow. Hi Jennifer – it says right below the recipe title: makes about 20-24 cookies. Have fun baking! I tried my best to make these right by the recipe. Well….mine turned out flat. :0( I read about other bakers having the same problem…..the reason I followed the recipe exactly. The taste is great!!! Just took these out of the oven. They are wonderful! Love these cookies! I made these earlier this week and brought them to work–they were a total hit! I work mostly with guys, and the cookies were gone in a flash! These cookies are perfectly soft and have amazing flavor! Arleen, when I’m baking vegan or run low on eggs, I use about 1/3c. Applesauce for each egg! The Cook’s people are genius! Arleen, the cookies will be slightly less rich, slightly less flavorful, and a little drier if you skip an egg yolk. These look delicious! I want to make them now, but I only have one egg. How will that affect the recipe? Thank you! Arleen – I have no idea. I’d definitely recommend making the recipe with the full amount of eggs since that can definitely impact how they turn out. We LOVE your idea to include chocolate to the classic sugar cookie recipe. Beautiful! I used light brown sugar and added 2 extra tbsp of flour for altitude. They came out perfect. I did chill the dough between batches and I think that helped them keep their form. Excellent hit with the family! I tried these today and WOW, they are fantastic! I loved the deep chocolate flavor and soft, chewy texture. I used Cacao Barry Extra Brute cocoa powder; this is definitely a recipe to use your best cocoa powder. Also, even though my melted butter temperature was 90F, the dough still seemed really soft to me, so I didn’t flatten the dough with a glass, I just baked the balls; they turned out perfectly. Thank you for such a great recipe, this is going into my regular cookie jar rotation. I just made these for the second time. The first attempt was a flop-flat as a pancake! This time I made sure the butter was not so hot and I added more flour and ….perfect! I did cut the cocoa a bit for my taste (I know, I know, can we still be friends??) Thanks for a new favorite cookie recipe! Mel, I’m finally getting around to commenting on some of your recipes that I’ve tried lately. Made these a couple Sundays ago when we all had a hankering for something sweet but I wasn’t wanting to spend much time in the kitchen. The kids scarfed these up, as did my husband’s grandparents to whom we took a stack. In regards to the altitude comments, I didn’t make any changes and didn’t have any trouble (7500 ft). I loved these cookies! Perfect for a chocolate fix. My husband ate them every night with milk until they were gone. I had to add more flour, altitude I am sure, and reduce the cooking time. They were soft and yummy! I like them as is, but they would probably be good with a cream cheese cookie frosting too! I made these this morning. The Cub and M’Lord approve. I used Hershey’s Special Dark cocoa powder and 1/2 tsp espresso powder, which increases the chocolate flavor, and got 46 cookies using a small cookie disher, baked for about 10 to 11 minutes. They spread out just fine without pressing them with a glass. Half of the batch was put in the freezer pretty quickly or they’d all be eaten in a day or so. This recipe will go in my keeper file. Thank you. I was sort of disappointed in these cookies. You really talked them up, so I was hoping for an amazing cookie. I am a cookie lover and bake cookies at least once a week (usually chocolate chip, which is so naughty because I can’t keep my hands off of them). Anyway- I made these today and they were just okay to me. I pressed them to 1/4″ thick, but I think that was too thin. So the next batch I did 1/2″ and they turned out much softer, but the flavor was still sort of blah to me. So sad, because I love most all of your recipes!! Don’t worry, I’ll be coming back lots more… just won’t be making these again. Here’s a “oneupmanship” for you! Warm two of these cookies in the microwave for 10 seconds, 15 if they’re frozen. Then make a “sandwich” out of them using Nutella. YUM! These are great cookies. My new BFC (best favorite cookie). The cookies were delicious! but very flat. I have that problem with a lot of baked goods. Would altitude change things because I usually end up adding at least 1/2 cup extra flour to most cookies and brownies I make. The recipe didn’t make as much as I expected but that’s my fault, the dough is awesome! Hi Nancy – yes, altitude can make a huge difference in baked goods and usually high altitude means baked goods (especially cookies) need a bit more flour. 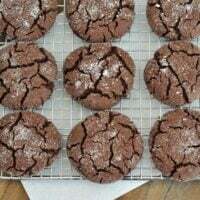 I just made these with my daughter and it reminded me of making chocolate crinkle cookies at Christmas time with my mom. So fun, and so delicious! Mine flattened out a little more than yours, but I’m baking at high altitude. I’ll have to work on the flour. Hello! I made these today and they are wonderful! Thanks for sharing!! Made these tonight. After cooking most of them after being flattened I realized they were just too thin for me so I did the last 6 in the oven as balls and they were perfect. I also made 41 based on my scooper. I measured by weight fwiw too. I’m in the south. All right. Mine were huge and flat. Butter too warm, you think? I’m laid up from knee surgery so I directed my 14 year old through the process (what? Because I’m not burning any calories, I shouldn’t be eating them?? ), but she seemed to be pretty meticulous. Still very yummy, of course. Hi Jessica – I hope you have a speedy recovery! And yes, I think it was probably the butter being too warm…it really shouldn’t be warm/hot or all. Oh these look amazing! Can’t wait to try them!!!!!! Oh my gosh! I love the idea of these. I would never think of that! These look amazing. Are they like the ones in your recipe for the chocolate mint ice cream sandwiches? bluebaker – the ice cream sandwich cookies are a bit chewier. These are softer and a bit more decadent. Can’t wait to get these out of the oven…yum!! Yum, your cookies look and sound delicious! Do you have a cookie scooper you would recommend? Karin – I use a really old OXO scoop that is about 1 1/2 tablespoon size. would 1/2 cup + 1/4 cup + 2 tbsp be easier to measure? June – yes, the amounts you gave equal 14 tablespoons. Shannon – I didn’t think they were really, really huge. They don’t flatten much more in the oven after you press them down – they are a thick cookie. You could definitely make them smaller, too. I love sugar cookies too, so I’ll be making this chocolate version tonight. I’ve been feeling chocolate deprived since Easter. I keep dreaming about Cadbury eggs and chocolate bunnies. Oooh, All-Clad pots and pans. . . sigh. Seriously, these cookies look amazing, and I am barely holding myself back from running to the kitchen and baking up a batch by reminding myself I made several dozen cookies just yesterday! But these are next, no doubt about it. My MIL makes these for my kids, but they’re called wagon wheels. I’ll hardly bake them because her recipe calls for Crisco. So excited to see a butter version! Genius. I love sugar cookies. I love chocolate. I can’t wait to combine them with this recipe!! Yum!! This looks GREAT! I love finding recipes like this that are also Dairy Free, with a simple non-dairy butter substitution! Thank you!! I usually make the brown sugar by using 2 tbsp. blackstrap molasses to 1 cup white granulated sugar, mix thoroughly. Usually makes baked goods moister like chocolate chip cookies, for instance. 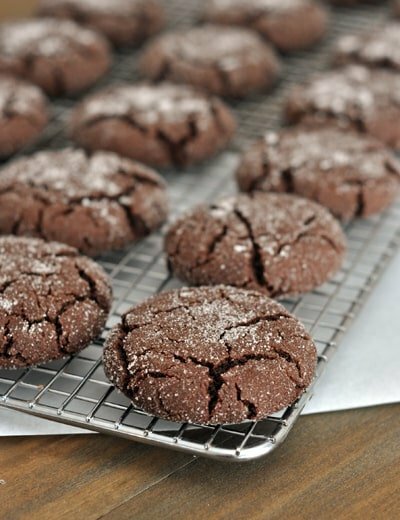 Thank you for sharing this recipe, love chocolate cookies! Oh Mel! These look divine. I might have to make them this weekend. I love sugar cookies too! I love a classic sugar cookie and chocolate would be that much better. Thanks! !